Adobe announced today the official release of Flex 3. Users of FlexBuilder will probably really like a new version of FlexBuilder, but the now open source nature of Flex is also going to appeal to many. I was a little surprised that as of this writing, the evening of this announcement, there is no press release on this available on the page with press releases. The most recent press release currently listed there for Flex is the 13 December 2007 announcement regarding the release of BlazeDS. One impact the timing of this release of Flex 3 has on me is that I now need to update my slides for Collaborate08 regarding Flex 2 and Flex 3. In my previous blog entry, I briefly wrote about Windows PowerShell. In this blog entry, I intend to cover some uses of Java with Windows PowerShell. Many Java applications require the environment variable JAVA_HOME to be set appropriately to work correctly. In PowerShell, you can check the setting of a particular environment variable with the command echo $env:JAVA_HOME. An example of this is shown in the next screen snapshot (click on image to see larger version). Another environment variable that is often useful to note when using Java is any CLASSPATH setting. This can be checked with the echo $env:CLASSPATH command. If the CLASSPATH environment variable is set, it will be displayed. What if you wanted to set your classpath for use in Java applications rather than passing the classpath to the application with the Java launcher? In that case, you could set CLASSPATH with the command $env:CLASSPATH = "<<someClassPath>>". The quotation marks are significant in setting the classpath because the semicolon (;) is still used to separate class path entries. Because the semicolon also tells PowerShell that a command is being terminated and another started, this must be in quotation marks to avoid the classpath being treated as two separate statements. Although many Unix-isms can be used in PowerShell, one should still use the semicolon for classpath separators as described in the Windows Setting the Class Path document rather than with colons for Unix as documented in the Solaris Setting the Class Path document. PowerShell does recognize semicolons as statement terminators for placing multiple statements on the same line. This very Unix-like feature means that class path values must be surrounded in quotes so that multiple entries can be separated with semicolons without making PowerShell think there are multiple statements on the line. The above command will behave exactly as the one shown above, but without the DOS-obvious C:\ drive syntax and the backwards slashes. It is not shown above, but you can find out more about using PowerShell environment variables by running the command man env (or help env) in the PowerShell terminal window. When specifying Java system properties on the command line in PowerShell, you need to put quotation marks around the these specifications so that the -D is not interpreted prematurely. The next screen snapshot shows running Java with the -D system properties options without quotes and the error that follows. The same screen snapshot then shows how it runs successfully if double quotes are used around the -D system properties. You can run the java -version command in PowerShell just as you would in DOS or Unix/Linux. The next screen snapshot demonstrates this. Similarly, you can run other Java executable tools in the same way you'd run them in DOS or in Unix/Linux. 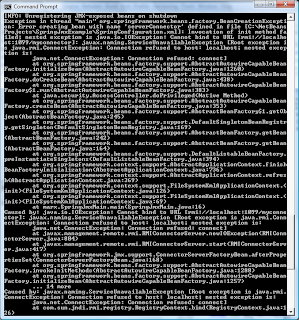 The next screen snapshot shows the command-line view of running these in PowerShell. PowerShell brings each of us a more "natural" Java development command-line experience if we've developed Java primarily in a Unix/Linux environment in the past. I have been frustrated for some time with DOS scripting. Fortunately, a colleague pointed me to Microsoft PowerShell (formerly known as Project Monad) for Windows XP and Windows Vista. PowerShell can be downloaded here and there are several scripts for use with PowerShell provided here. You can also download the Windows PowerShell Owner's Manual. One of the things that is nice about PowerShell is that is supports many of the commands that we like to use in Unix/Linux. There are far too many useful things to demonstrate about PowerShell in one place, but the next two screenshots (click on them to see larger versions) demonstrate some Unix-like commands supported in Windows PowerShell. The first screen snapshot demonstrates the very handy history command along with the ability to run a man (equivalent to help) command for a particular command. The next screen snapshot shows the ls command along with the mv command. Having Unix equivalents makes it less frustrating to switch between Unix/Linux and Windows. Also, the ls and mkdir commands demonstrate the displaying of file modes. Besides the Unix/Linux commands shown in the screen snapshots above, other goodies that are now available in PowerShell include pwd, ps, and cat. It is amazing how nice it is to have these little "extras" in the DOS scripting world. Windows PowerShell requires .NET framework 2.0, so you'll need to get this if you don't already have it. 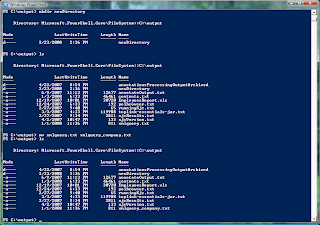 There is much, much more to Windows PowerShell than what I've shown here so far. 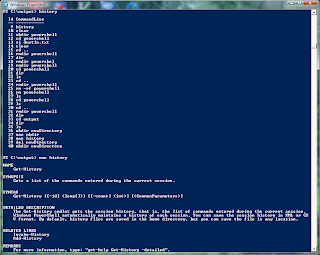 I think it is likely that I'll post future blog entries on other great features of PowerShell. It is even more likely that I'll start using PowerShell more frequently in my blog entries that show me running scripts, Java commands, the Flex compiler, etc. from the command line rather than using the old-style DOS terminal. In related resources, Vaibhav discusses running PowerShell from Java. An interesting related article is A Return to Command-Line Control with Windows PowerShell. A free Windows PowerShell eBook is available as well. Finally, two other introductory references for using PowerShell are What is Windows PowerShell? and Top Ten Tips for Using Windows PowerShell Finally, a gentle introduction to Windows PowerShell is available in Discover PowerShell. Trang has been around for a while and is a useful utility for converting between types of XML Schema. In fact, the most recent version for download at the Trang site is version 20030619 (note the date embedded in the version name). Besides being useful for converting between XML schema definitions, Trang is also useful for generating a new XML schema definition from one or more source XML files. In fact, this use of Trang is the focus of this blog entry. In this blog entry, I will demonstrate how simple it is to apply Trang to generation of W3C XML Schema and DTD definitions from a source XML file. Oracle provides the highly useful Java OracleXMLQuery class for querying the relational database and provide the query results in XML format. The OracleXMLQuery class provides the setRowsetTag(String) method to specify the Java String to be used as the root tag of the generated XML file containing the query results. Likewise, the OracleXMLQuery.setRowTag(String) method allows one to specify the String label provided for each row element tag in the generated XML file. The XML below was generated using OracleXMLQuery with the rowset tag specified as "Employees" and the row tag specified as "Employee." The query used to generate this XML was run against the HR schema and is shown next. The XML generated by OracleXMLQuery is shown next. Note that this generated XML has the "Employees" root tag and "Employee" row tags just as we specified with OracleXMLQuery. The rest of the XML elements are named based on the names of the columns in the SELECT statement and are all in uppercase. These individual element names correspond with the four columns in the SELECT clause. It is useful to have the XML shown above generated by OracleXMLQuery, but XML is often much more useful if we have a schema defining it. This is especially true if using technologies such as web services that require an XML schema. When you have example XML files but lack a schema definition for them, Trang comes to the rescue. The next screen snapshot (click on image to see larger version) displays the Trang help menu when unzipped from its downloadable ZIP file and executed with the Java launcher using the java -jar trang.jar command (trang.jar is an executable JAR) without any options. To generate a W3C XML Schema that defines the generated XML shown above, run the executable trang.jar command again, but this time specify an input file (the generated XML shown above) and specify an output file after that. In this case, I am running this command as: java -jar trang.jar employees.xml employees.xsd. Trang detects that I want the a W3C XML Schema definition generated for the provided XML file because it recognizes the first listed argument as an XML file based on its extension (.xml) and recognizes the target format based on its extension (.xsd). The Trang manual also explains that you can use explicit options to specify the types of conversions to take place if you don't want to rely solely on file extensions. Without much effort on my part, I have a W3C XML Schema file that describes my generated XML. In practical terms, I am likely still going to need to narrow down some of the definitions because it is no surprise that Trang cannot detect more granular datatypes than general types like xs:string. So, I will almost certainly need to create more granular schema types if desired. However, this gives me a compliant starting point to add more specific details as desired. We are not limited to generating W3C XML Schema with Trang. We can also generate the older, less descriptive Document Type Definition (DTD) with the command: java -jar trang.jar employees.xml employees.dtd. The next listing demonstrates a DTD generated with just such a command. Trang also allows generation of regular RelaxNG and compact RelaxNG schema definition formats as well. The simple changes to the command to get these two formats as well as the output from each are shown next. With the two above examples of RELAX NG schema generation covered, the screen in which all four of these commands were run to generate XML Schema, DTD, RELAX NG, and compact RELAX NG are shown in the next screenshot. Note that there is no obvious output of the generated files, but the files will be found in the directory. For organizational purposes, I had my employees.xml file in a subdirectory called "input" and that is specified as part of the input file name. Trang allows for multiple XML files to be specified as input as long as they are all passed in before the schema file that you want generated. This is useful if you want to generate one of the four schema types for a collection of related but not necessarily exactly the same XML source documents. Another common use of Trang, especially in years past, was to migrate existing DTDs to W3C XML Schema. DTDs are necessarily less descriptive than W3C XML Schema, but such a conversion could at least get one started on a compliant Schema that could have greater description added. Finally, in earlier versions of Java SE 6 there was a bug that prevented Trang from working correctly. However, I ran the examples shown here in Java SE 6, confirming that this bug has been fixed and closed. The following are some links to Trang-related resources. Some of these were cited above as embedded links. In my Publishing JMX Notifications with Spring blog entry, I demonstrated the use of the Spring framework to publish JMX notifications from Spring-exposed MBeans to clients. In that blog entry, I passed a Java String as the optional User Data object in the published Notification. In this blog entry, I'll cover how to pass a custom object rather than a standard Java String. The code for the main executable is the same as shown in my last blog entry. 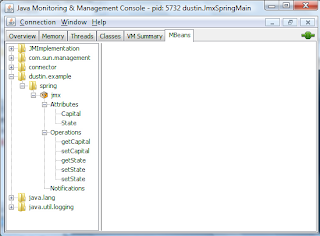 Likewise, the Spring configuration XML is also the same as shown in that blog entry and so is not shown here. The one piece of code that is different to supply a custom object to a Notification is the class that is Spring-exposed as an MBean. That class's source code is shown here with the new code highlighted. * allow this bean-turned-MBean to easily publish JMX notifications. * @param aOldValue Value prior to setting of new value. * @param aNewValue Value after setting of new value. * @return Generated JMX Notification. * inject a NotificationPublisher into me. * @param aPublisher The NotificationPublisher that Spring injects into me. In my previous blog entry, I provided a simple String to the Notification.setUserData(Object) method and did not need to do anything else, even on the client side, because String is Serializable and JMX clients understand Java Strings without any extra classpath information. However, with my own custom class now, I'll need to specify more on the classpath when running the JMX client. First, however, let's define the UserDataObject class used in the code above. * Constructor accepting parameters to set all of my necessary parts. * Provide String representation of this object for use with JMX Notifications. * @return String representation of me. Because this UserDataObject will need to be used by the JMX Client that listens for the published JMX Notifications, it is important that this class be declared as Serializable . The code to ensure that this class is Serializable was highlighted above. If the user data object was not serializable, an error similar to that shown in the following snapshot (click on it to see larger version) would appear. Even with the custom user data object declared as Serializable, JConsole will not be able to display the remote JMX Notifications if run locally with no extra options set. When we try to use JConsole to listen to these published JMX Notifications without specifying any extra options, we'll see an error like that shown in the next screen snapshot (click on image to see larger version). Because this example was run on Windows, the included class path uses double quotes around the %JAVA_HOME% environment variables and semicolons are used to separate classpath entries. Because I was overriding the JConsole classpath, I needed to provide the jconsole.jar and tools.jar JARs on the classpath in addition to my custom user data class (which I encapsulated in userClient.jar). With the custom user data object specified as Serializable and provided on the classpath to the JMX client (JConsole), we can now see the successful results. The first of the next two screen snapshots shows a snippet of running the main application and entering three strings to be published in the JMX Notification. The second of the next two screen snapshots shows the JMX Notifications received by the JConsole listener when it is executed as shown above and in the first screen snapshot. In this blog entry, I have attempted to demonstrate how custom user data objects can be associated with JMX Notifications even when they are published to remote clients. The two main things to remember are to make the user data object serializable and to make it available on the client's classpath. Two useful forum threads on custom objects on the JMX client side and ways to work with them are jconsole context classloader issue and jconsole no security manager exception (RMI classloader disabled). The Spring 2.5 Reference provides excellent coverage of how to publish JMX notifications with Spring. Note that these JMX Notifications can be published locally or remotely. In this blog entry, I will demonstrate how to publish a JMX Notification via Spring for remote listeners. Another outstanding resource on JMX remote features is the Sun Java Tutorial entry Creating a Custom JMX Client. The first code shown here is the XML code that configures our Spring container. Note that nothing specific to publishing JMX Notifications is included in this XML configuration, though there are entries to handle remote JMX. The next source code listing shows a pretty normal Java class, but it does feature a Spring-specific interface (NotificationPublisherAware) that it implements a single method (setNotificationPublisher) for. The above class is not an MBean by itself. Rather, Spring exposes it as an MBean because of our use of the MBeanExporter in the XML configuration. However, there were some JMX-specific classes in this class to enable Notifications. Also, as mentioned above, the Spring-specific NotificationPublisherAware interface is also explicitly implemented by this class. We need a main executable Java class to bootstrap the Spring container and to allow us the opportunity to interact and set someValue so that the JMX Notifications will occur. The source code for that class is shown next. * Spring-exposed MBean Notification Publisher. * Main execution for JMX Spring Notification Publication example (server). The above class can be run to use the Spring container to expose SomeJavaObject as an MBean capable of sending JMX Notifications to local or remote clients. Note that Java SE 6 is required to run this example because of use of features specific to Java SE 6. When this main Java class is executed, the output will look something like the following screen snapshot (click on it to see larger version). I have entered some arbitrary values to demonstrate the JMX Notifications will be sent when we attach a JMX client later. We can run JConsole to see if the JMX Notifications are being published. 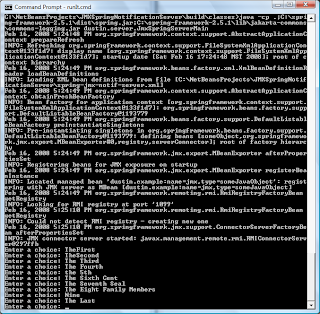 The following screen snapshot (click on it to see larger version) shows how JConsole appears when run alongside the application executed above. Note that I used Java SE 6's JConsole and that I had JConsole already running when executing the main Java application and that I had clicked on its "Subscribe" button in the MBeans Notifications section. There are several interesting observations from this JConsole output. For one, JConsole nicely displays the timestamps I provided in the Notification as a long timestamp. Another interesting observation here is that the UserData column displays exactly the String I passed the Notification.setUserData(Object) method in the code. This only worked because I passed a String to this method that expects an Object. Had I not passed a String, I would have needed to pass a class that had a toString() method overridden appropriately and was available to a remote JMX client to have this be a sensible value. Using a String was the easy way out for this example. You may have noticed that I did not need to specify the "notificationPublisher" injected into the class that implements Spring's NotificationPublisherAware interface. Spring apparently does this automatically without any need to explicitly specify/configure this injection. In fact, I lost more time than I care to admit trying to specify this Notification Publisher in the Spring XML configuration file because this is shown in the second edition of Spring in Action (page 483). This book is generally a nice introduction to Spring and has been very beneficial for me, but something must have changed in Spring since the writing of this section. Anyway, it seems that you should NOT explicitly configure the injection of ModelMBeanNotificationPublisher despite what is shown on page 483. By the way, if you omit that one XML snippet from this book's coverage of JMX Notifications with Spring, the remainder of the example seems to accurately describe JMX Notification Publishing via Spring. The Spring documentation warns repeatedly that any natural JMX MBeans (objects that are MBeans before Spring exposes them as such) should NOT use Spring's JMX publication support and should instead use JMX Notification APIs directly. The Spring framework makes it very simple to expose normal Java objects as JMX (Java Management Extensions) MBeans via Spring JMX configuration and no changes to the actual Java class. The following code snippet shows a normal Java class (POJO) that will be exposed as a JMX MBean via the Spring framework. * MBean via Spring MBean exposure. Note that the Java class defined above does not implement any interfaces and is so basic that it does not require even a single import statement. One may argue that this is a contrived example, but it will illustrate some issues later in this blog entry. More specifically, I intentionally named two methods setState that are overloaded by different parameter data types. A better class design would have named these method names a lengthier, differentiating name, but I intentionally wanted these same-named methods to illustrate a point. The main application that loads the Spring context is shown next. * Simple example demonstrating Spring-exposed JMX beans. The code listing for this class shows that it is a very simple executable class mainly meant to bootstrap a Spring container in a Java SE environment and then wait for pressing of the ENTER key. This forced suspension of execution is intentional so that the process will not complete too quickly. This allows for JConsole to be used to monitor the StateHandler class once Spring has turned it into a Model MBean. The Spring XML configuration that is accessed by the main class and which instructs Spring to expose StateHandler as a JMX Model MBean is shown next. With the code shown in the listings above, the Spring framework will expose all public methods defined in StateHandler as JMX MBean operations and will expose attributes based on get methods defined in StateHandler. 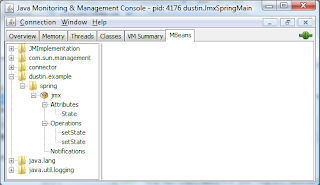 This is illustrated by the following snapshot of JConsole when attached to this Spring-powered and Spring-exposed MBean (click on images to see larger versions). As the above screen snapshot shows, JConsole is providing access for administrators to change the state name and state capital via JMX. This is probably not intended and we really only want to change the application state rather than the state name. We can use an assembler to instruct Spring on which methods and properties to expose as MBean operations and attributes. In this blog entry, I'll focus on two of these approaches: the method name approach and the interface-based approach. Spring allows us to specify which methods we want exposed on a bean-exposed-as-MBean. The Spring XML configuration if file to make this happen is shown again with the changes to make this happen on lines 20 and 24-31. When this new Spring XML configuration file is used, the exposed MBean operations are limited to what is specified in the Method Name Bean Assembler. The output when using JConsole now to monitor the application is shown next. We only exposed a single setState method name in our configuration above. So why are there two setState operations in the JConsole window? The explanation for this is that Spring has no way of knowing which setState method is being specified because it cannot differentiate between these overloaded methods based on method name alone. The next approach, using a Java interface to specify which methods are exposed, will work better in this situation. The following Spring XML configuration uses an interface-based approach rather than a method name approach to narrow which methods and properties Spring should expose as MBean operations and attributes. Again, the relevant new XML code is on line 20 and lines 24 through 31. Note that a Java interface is specified in the above XML. This very simple interface is shown next. When this newly configured Spring-powered application is run with this interface-based JMX exposure, JConsole displays the results shown in the next snapshot. With the interface-based approach we were able to instruct Spring more specifically on which of the overloaded methods we wanted exposed as an MBean operation. Note that we did not even need to have the POJO class StateHandler implement this interface (though it is often nice to do so to allow the compiler to ensure that a POJO that will be exposed as an MBean provides anticipated methods for JMX operations). Our regular Java object could remain untouched and this interface could be applied in the Spring configuration only to narrow down the exposed JMX operations. Another common way to configure Spring to expose certain Java methods as JMX operations and certain Java properties as JMX attributes is to use Spring-expected annotations in the source code. Unlike the method name approach and interface-based approach shown in this blog entry, this approach does require Spring-specific annotations to be added to your previously non-Spring-specific Java classes. The advantage gained for this price, however, is the ability to even more finely control what is exposed as an MBean and to provide significantly more descriptive information to the exposed MBean, its attributes, and its operations. One final note should be made about the Spring XML configuration examples shown in this entry. In all three entries, I specified RMI server connection information and instructed Spring to set up an RMI registry to support remote JMX features. This remote support was not necessary to use the examples, however, because I used JConsole on the same host as the managed application and both (JConsole and the managed application) were run under my same user ID. I finished my two presentations at Rocky Mountain Oracle Users Group (RMOUG) Training Days 2008 over the past two days. The group that attended the Apache POI presentation was relatively small and did not have many questions during or after the presentation. The group at the XQuery presentation, however, was much larger and had many questions during and after the presentation. This blog entry covers some of these questions and the answers. Before getting into some of the questions that were asked along with answers to them and additional references associated with them, I'd like to thank all those who attended my two presentations and especially thank those who asked questions. How do you use Oracle's proprietary ora:view function with more than one table (joins)? To this question, I answered that the only way that I could think of and had seen to do this is to use ora:view on a Oracle database view. This appears to be the appropriate answer as documented in the Using XQuery with Oracle XML DB document. Can you query the contents of Microsoft Office documents with XQuery? It is possible to use XQuery to query the contents of Microsoft Office 2007 documents (or documents saved in the Office Open XML format using the available converters for older versions of Office applications). In fact, this is documented in the article XQuery Your Office Documents. Note, however, that this requires that the XQuery engine be able to open ZIP files and I have not been able to find a way to do that automatically with Oracle's XQuery implementation. One could still open the Office Open XML ZIP file in another way (using ZIP utility or JAR or similar mechanism) and then XQuery the contents. The meeting participant who asked this question needs to query Office applications data prior to the Office Open XML format, so I told her that XQuery will not be able to help here. While my other topic at this conference (Apache POI) is useful for reading Excel, it does not work natively out of the database like XQuery does with Oracle's XQuery implementation. How do you use XQuery with an XMLType Database Column? Although I had many XQuery examples in my presentation, I did not specifically demonstrate the use of the SQL/XML standard XMLQUERY on an XMLTYPE database column. Fortunately, a good example of this is demonstrated as Example 18-8 in the Using XQuery with XMLType Data section of the Using XQuery with Oracle XML DB chapter of the Oracle XML DB Developer's Guide 11g. The key to this is the use of the PASSING clause. How do you terminate an XQuery expression? I think I may have misunderstood this question and given an answer to a different question. I think what the attendee was asking is how one could have multiple XQuery statements in a single document running procedurally. It is important to note that an XQuery Scripting Extension is currently under work in the Worldwide Web Consortium (W3C). The XQuery Prototype with XQLPlus README document discusses using an XQuery .xql file. Perhaps the best example of complex XQuery used similar to XSLT is the article Generating XML and HTML with XQuery. This example uses XQuery custom functions embedded within a master XQuery expression. In other words, with XQuery, nesting XQuery expressions is the approach often used to build elaborate transformations. Finally, the Querying XMLType Data section of the article Querying, Constructing, and Transforming XML with XQuery also shows how nested XQuery expressions can be used in transformation. Is Apache POI Related to or Dependent On Apache HTTP Server? For those of us who use several Apache products, this is an easy question and answer. However, I thought it was a good question that reminds me that many in the IT community, especially those outside of the Java development community, may not be as familiar with the Apache Software Foundation. Just as Oracle Corporation is still most often associated with database products by many DBAs and developers, it is likely that Apache implies HTTP server (or perhaps Tomcat servlet container) to many people as well. I pointed out that not only is Apache POI not dependent on Apache HTTP server being present, but that they in fact have very little to do with each other besides their common "Apache" name. UPDATE (16 February 2007): The following are some other accounts in the blogosphere regarding recently concluded RMOUG Training Days 2008. * "RMOUG - Excellent Ending, Now on to Collaborate 2008 in Denver"
* "RMOUG Training Days - February 13, 14 2008 in Denver, CO"
* "RMOUG 2008: MySQL and Oracle Fusion Middleware Presentations"
Can a Performance Tuning Tool be Complete? In this blog entry, I'll demonstrate the importance of using the depends-on attribute when using Spring with JMX and a Spring-provided RMI Connector. The next code snippet is an example of a basic Spring configuration file. Most of it is unimportant for this example, but the highlighted section shows what is really important for this blog entry. I am not showing the actual bean class exposed here or the interface it implements because these details are not important for the purposes of this blog entry. When the full application is run with the XML as configured above, the following stack trace is encountered. "Exception in thread "main" org.springframework.beans.factory.BeanCreationException: Error creating bean with name 'serverConnector' defined in file [C:\NetBeansProjects\SpringJmxExample\SpringConfiguration.xml]: Invocation of init method failed; nested exception is java.io.IOException: Cannot bind to URL [rmi://localhost:1099/jmxrmi]: javax.naming.ServiceUnavailableException [Root exception is java.rmi.ConnectException: Connection refused to host: localhost; nested exception is: java.net.ConnectException: Connection refused: connect]." When the Spring-based application is run with the above three system parameters, the application works properly. However, this requires specifying the three parameters above on the command-line. To keep the RMI registry information in the Spring XML configuration, the RMI registry entry either needs to be placed in the XML configuration file above the ConnectorServerFactoryBean entry or the serverConnector (ConnectorServerFactoryBean) element needs to reference the RMI registry. The second option, having the serverConnector reference the RMI registry is accomplished using the depends-on attribute. The modified code listing below shows the rearrangement of the RMI Registry entry to precede the serverConnector and it also shows use of the depends-on attribute. Either of these changes will make the example work without any special command-line system parameters, but I like to do both. As stated above, either action (placing the RMI registry in the Spring XML configuration before the serverConnector or using the depends-on attribute) will make the example work. The advantage of the depends-on attribute is that the XML file can be changed more safely without order of elements causing trouble. Neither the use of the depends-on attribute or the ordering of the serverConnector (ConnectorServerFactoryBean) and registry (RmiRegistryFactoryBean) are as well advertised as one might expect, but information on these approaches are available in several locations. One source of information on using depends-on to address this issue is the Spring forum message Spring, JMX, and RMI. Another source describing this is the Javadoc-generated API documentation for the RmiRegistryFactoryBean class. This class description includes this paragraph: "Also useful to enforce creation of a local RMI registry at a given port, for example for a JMX connector. If used in conjunction with ConnectorServerFactoryBean, it is recommended to mark the connector definition (ConnectorServerFactoryBean) as 'depends-on' the registry definition (RmiRegistryFactoryBean), to guarantee starting up the registry first." The Spring 2.5 Reference does not address the depends-on attribute or importance of ordering in its JMX section, but it does describe that depends-on is occasionally necessary. Will Apache POI Support Office Open XML Format?